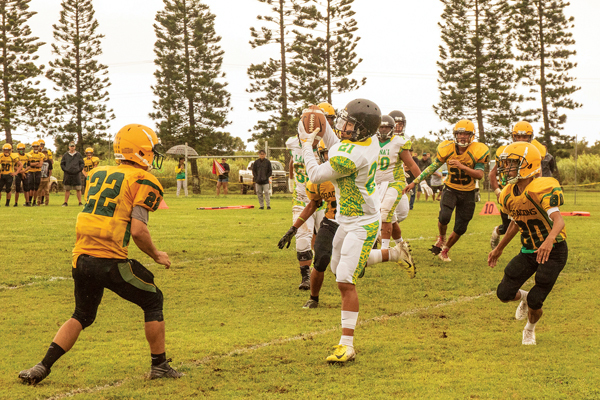 The Lanai High School eight-player football team rushed out to a 36-0 lead early in the second half and rolled to a 64-24 win over Hana on Saturday in Lanai City. The Pine Lads are now 4-0 in Maui Interscholastic League play — they can clinch the school’s first football title with a win next Saturday at Molokai or at least a share of the title with a win against Seabury Hall on Oct. 20 in Lanai City. The Dragons fell to 1-3. Lanai quarterback Devrene Kahananui-Alejado scored on a pair of 1-yard runs and a 24-yard run, and also threw a 59-yard scoring pass to Kane Tubera, and Naighel Calderon scored touchdowns on runs of 1 and 99 yards. Kian Tubera had a 9-yard scoring run, and the final touchdown for Lanai was a 67-yard scoring run by Jesse Sigrah. The Pine Lads also scored on defense when Ardell Muller recovered a fumble in the end zone. 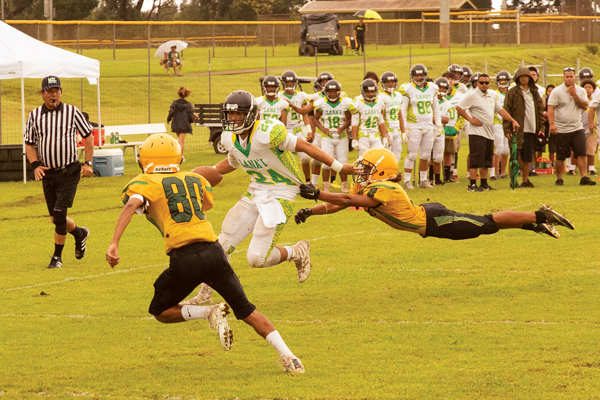 Hauoli Sinenci caught a 43-yard scoring pass from Chanson Hoopai-Waikoloa, Hauaka Park recovered a fumble in the end zone and Jesiah Malaikini had a 5-yard scoring run in the third quarter as the Dragons pulled within 44-18. Hana’s last touchdown was a 20-yard pass from Nahinu Lind to Irie Pu-Akima in the fourth quarter. L–Kian Tubera 9 run (Jesse Sigrah pass from Deverene Kahananui-Alejado), 7:24. L–Naighel Calderon 1 run (Kane Tubera from Kahananui-Alejado), 5:19. L–Kahananui-Alejado 1 run (Kahananui-Alejado pass from Calderon), 0:36. L–Kahananui-Alejado 1 run (conversion failed), 0:05. L–Calderon 99 run (conversion failed), 11:45. H–Hau’oli Sinenci 43 pass from Chanson Hoopai-Waikaloa (conversion failed), 9:51. H–Hauaka Park fumble recovery in end zone (conversion failed), 3:16. L–Kane Tubera 59 pass from Kahananui-Alejado (conversion failed), 1:17. H–Jesiah Malaikini 5 run (conversion failed), 0:05. L–Kahananui-Alejado 24 run (conversion failed), 11:05. L–Ardell Muller fumble recovery end zone (conversion failed), 9:59. H–Irie Pu-Akima 20 pass from Nahinu Lind (conversion failed), 7:07. L–Jesse Sigrah 67 run (Ryllah Rodrigues pass from Kahananui-Alejado), 6:34.